I have been excited about trying out the new Wii Fit ever since I first heard about it. Imagine that I could play video games and improve my health at the same time. I made the mistake of not pre-ordering the Wii Fit and I have had a terrible time trying to find one in Chicago for the past week. I have looked online, made personal visits to stores, and asked people to let me know if they see one in a store so that I could either go get it or have them buy it and I’ll pay them back. This past Tuesday it seemed like there were no Wii Fits within a hundred mile radius of Chicago. Then I found out that the Best Buy closest to my house actually has some in stock, but because the Wii Fit will be advertised in this Sundays sales paper they will not sell any until then. So for those of you still looking, you can go to Best Buy this Sunday, but go early; I think they will sell out again. They are supposed to have at least 20 per store. So back to my treasure hunt I was watching the Celtics – Lakers NBA Finals first game when I checked the Wal-Mart website and lo and behold I saw a few stores had the Wii FIt in “limited availability”. Now it’s almost 9:00 PM local time and the store closes at 10:00 PM. I called three stores before finding one that was about twelve miles away. The woman at the store said that she could not hold one for me, but she was pretty sure that they would not sell out by 10:00 PM. Annnnnnnd they’re off! I made a mad dash across the city to get there before ten. I actually pulled into the lot at 9:40 PM and quickly made my way to the electronics department and I finally laid my eyes on the prize. Almost $100 dollars later I speed walked my way back the car with anticipation of lowering my BMI and losing at least 25 pounds over the next two months. I’ll keep you updated on my progress and I’ll share some Wii stories along the way. By the way, one of the first exercises that I did was ski jumping and I almost fell off the balance board and into the TV. I had to laugh at myself for that one. My comment: I’m looking forward to picking this up when I see it on sale in Chicago. Once I get it, I’ll let you know how I like it. Nintendo’s Wii introduced sedentary gamers to the idea of moving off the couch. 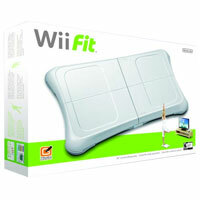 Now Nintendo is coming out with the Wii Fit, an add-on designed to appeal to women looking to lose weight. Nintendo of America’s Cammie Dunaway talks about challenges posed by the product’s marketing.